The Location is Not Safe!!! 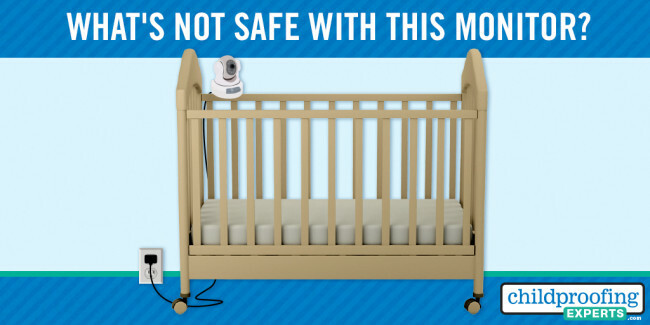 Are your baby monitor and cords at least 3 feet away from the crib? Professional childproofers visit homes to educate families about home hazards. 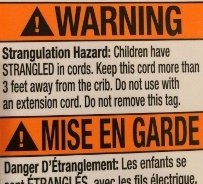 Although baby monitors come with important warnings, our childproofing experts are still seeing unsafe installations of baby monitors and cords. We investigated this issue further by evaluating the placement of baby monitors and cords in nurseries during home visits. 60% of baby monitors/cords were installed incorrectly – the baby monitor and/or the cord were within 3 feet of the crib. Common problems: baby monitors on crib railings or in cribs. Baby monitors were also installed on walls near cribs or on nearby furniture (less than 3 feet from the crib). Only 40% of baby monitors/cords were installed safely – both the monitor and cord were installed at least 3 feet from the crib. 80% of the baby monitors that were installed incorrectly included warning labels. This led us to conclude that many warnings were not read or ignored. Install baby monitors AND all cords at least 3 feet aw ay from the crib or play yard. Do not place baby monitors in cribs or on the edges of cribs. Little exploring hands can reach through crib slats and pull dangerous cords into a crib. Long cord covers can be used to cover cords. 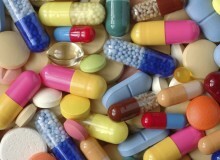 However, smaller cord clips are often choking hazards and should not be used. Do not use extension cords. Read the warning labels and instructions! They contain important safety tips. Be sure to place baby monitors and cords at least 3 feet away from cribs. Install baby monitors and cords safely from day 1 because you might not be able to predict when your little one will find trouble. Newborns might not be able to reach a cord but children change quickly and become more active.